This is in the Shibuya District of Tokyo …probably one of my most favorite places to walk and see what's new in Tokyo. A lot is always going on in Shibuya. 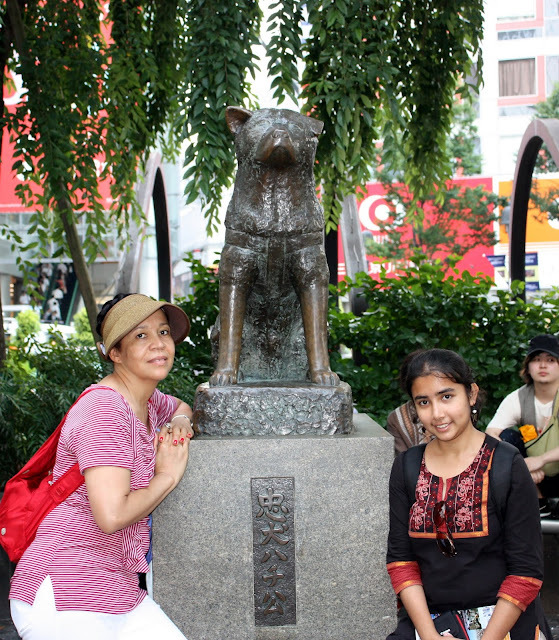 And this is Hachiko…the famous loyal dog that is at the center of the district. I met a student at the station and she told me about the story of Hachiko. He was brought to Tokyo in 1924 by his owner, a college professor named Hidesamuro Ueno. Each day, when Ueno left for work, Hachiko would stand by the door to watch him go. When the professor came home at 4 o’clock, Hachiko would go to the Shibuya Station to meet him. Ueno died of a stroke while at the university. Hachiko didn’t realize that he was gone, and so the dog returned to the train station every single day to await his master. He became such a familiar presence there, in fact, that the station master set out food for the dog and gave him a bed in the station. Even so, Hachiko never shifted loyalties –every day at 4 o’clock, he waited by the tracks as the train pulled in, searching for his best friend’s face among the people getting off. Hachiko died in 1935, after waiting for his master for 10 years. But the dog would not be forgotten –a year before his death, Shibuya Station installed a bronze statue of the aging dog, to honor its mascot. The student told me that the statue was melted down during World War II, and a new version was created in 1948 by the son of the original artist. If you are ever in Tokyo, go to Shibuya station, and you’ll be able to see the bronze statue of Hachiko. He is still waiting, as loyal as ever, for his master to come home. Animals are amazing creatures, please treat them humanely.